There has been an extensive literature on productivity (real output per hour worked) performance. Some studies look at the reasons behind the recent weak UK productivity dynamics (see Barnett et al. (2014)). Others have compared productivity across countries (see, for example, Weale (2014)). There is ample evidence in macroeconomic literature (see, for example, Bergeaud et al. (2015)) for a long-run tendency of productivity levels of both advanced and emerging economies to converge towards a global “technological frontier” – typically the United States. Convergence generally takes place through convergence in total factor productivity (TFP), as catch-up economies adopt technologies from frontier economies. However, in recent years, and especially after the onset of the financial crisis, the ability of catch-up economies to resume historical convergence trends is very much an open question. This is also the case for the UK. Chart 1 shows a long time series of the level of productivity in the UK and the US. Up until the early 20th century, productivity was actually slightly higher in the UK than in the US. During the inter-war period, and after WWII, the US and UK productivity performance diverged – in part as the UK suffered the impact of loss of life and physical destruction on its own soil as well as from less competitive product markets. But then, from the 1960s onwards, productivity levels in the UK (as well as in many other advanced European economies) started catching up with US levels. The most likely causes for this were the diffusion of US technologies and a catch-up in education levels (see Bergeaud et al. (2015)). The catch-up process then stalled in the late 1990’s as the US exploited the positive effects of the ICT boom more efficiently than the UK (see Basu et al. (2003)). Even though the chart is persuasive, it does not provide econometric evidence of convergence. 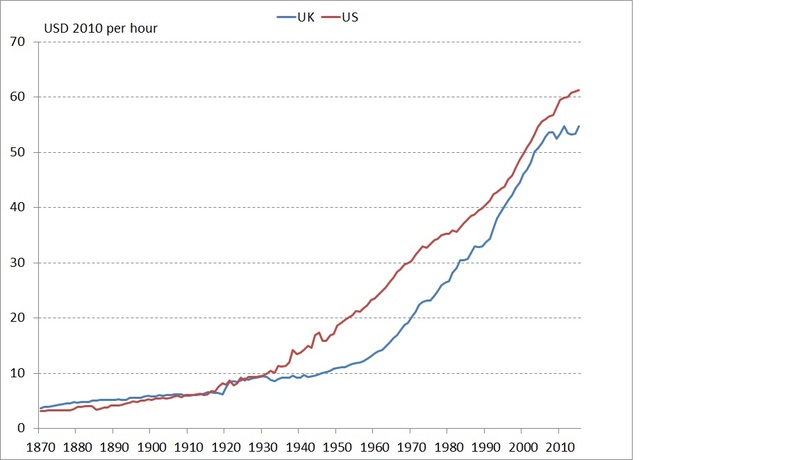 To formally test for convergence between the UK and the US productivity levels, I have applied traditional cointegration tests using a vector error correction model (VECM) to post-WWII productivity data in the two economies. The results suggest that even though the convergence appears to have lost some of its intensity during the ICT boom, there was a statistically significant, common cointegrated linear stochastic trend between the levels of productivity in the UK and the US between 1945 and 2007. However, since the onset of the financial crisis in 2008, productivity dynamics between the two countries have diverged. My results suggest that when the whole sample, including the post-financial crisis period of 2008 to 2015, is used, there is no cointegration relationship between the two data series. In other words, the financial crisis caused such a large shock to the relative UK and US productivity levels that historically robust convergence trends broke down. What do the VECM results suggest for productivity prospects in the UK going forward? Assuming that the catch-up process resumes according to the relationship suggested by the pre-crisis VECM results, and making some simplifying assumptions about US productivity growth going forward, UK productivity growth could pick up to around 2.5% from its current levels of around 1% in the next few years. This would represent relatively healthy productivity growth, slightly above pre-crisis averages. However, this relatively positive view depends crucially on whether one believes in the possibility of UK productivity resuming its catch-up process with the US or not. It is far from obvious why this convergence should start after several years of diverging productivity dynamics between the two countries. Ultimately, the ability of the UK economy to catch up depends on it being able to make progress on fundamental factors driving long-term TFP growth. Several factors are likely to be important for the UK economy, as also highlighted in recent surveys by the European Commission and the OECD. In particular, these surveys focus on a need for improvements in education, for measures to reduce income inequality and poverty, for further development of innovation and skills of the knowledge-based economy, and for strengthening investment, especially in infrastructure. 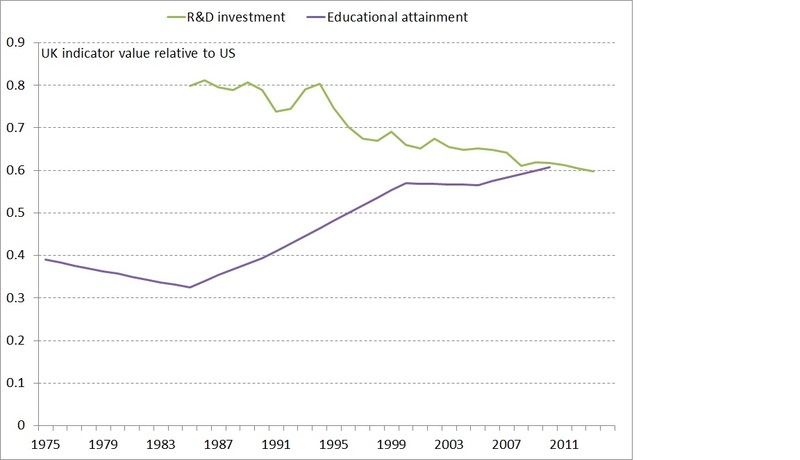 My regressions with available indicators of selected long-term factors suggest that educational attainment and R&D spending are especially important for UK productivity growth in terms of catching up with the US. The UK has been catching up on the educational attainment indicator (measured by the percentage of adult population who have completed tertiary education; see Barro and Lee (2014)), though it still remains well below the US levels. But R&D spending (measured by OECD statistics on expenditure on R&D as % of GDP) has declined steadily (Chart 2). Hence, recent dynamics of the fundamental factors do not currently paint a particularly positive picture for long-term productivity growth in the UK. Overall, if one believes in historical pre-crisis trends, there is potential for the UK economy to resume its previous catch-up process with US productivity levels. In this scenario, the near-term prospects for UK productivity growth look relatively good. However, looking at some of the more fundamental factors of productivity growth, my analysis suggests that this view is probably too optimistic. There has not been any clear improvement in many of the fundamental factors driving productivity potential in recent years, which would tend to cast doubt on the UK productivity convergence prospects, at least in the near term. Marko Melolinna works in the Bank’s Structural Economic Analysis Division.